Do you have a pretty cup and saucer that doesn’t match the rest of your tea set, but is too nice to throw away? Recycle it into a romantic teacup candle lamp with these easy directions. It really doesn’t get much easier than this… creating this lamp took minutes and it is absolutely adorable! The electric candle stick used for this project is complete and uses a low watt bulb. It’s very important that a low watt bulb is used or the clay pot will get too hot. The bulb is a standard indoor Christmas bulb. Another safe alternative is to use a battery-operated candle stick, which you can operate almost anywhere. 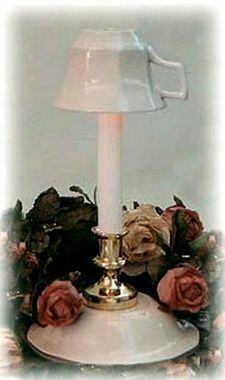 To create this lamp, glue the candlestick base to the bottom outside or the top inside of your saucer (I glued mine to the bottom, as this teacup and saucer do not have a pattern on the china). If your set has a nice pattern, don’t cover it up by turning the saucer upside down. The teacup stays in place on the bulb, through the hole in the clay pot saucer. You’ll need to test your pot to make sure it will rest on the bulb without tipping over. Look at the assembly photos, and test your pot as shown. I used a 2 inch clay pot. Glue the clay pot to the inside of the teacup, as shown. Make sure that the teacup sits nice and straight on your lamp. While the glue is still wet, test your shade and slide the teacup in place to make it a perfect fit. The clay pot in my teacup needed to be placed closer to the handle side of the cup, in order to hang straight. The weight of the cup handle pulled the cup sideways, so be sure to test your teacup shade and adjust the placement of your clay pot accordingly. Allow all of the glue to dry and you’re all done! Now wasn’t that easy? This is a wonderful night lamp for the kitchen or a guest bedroom and made with pretty vintage teacups and saucers, adds so much to a room.